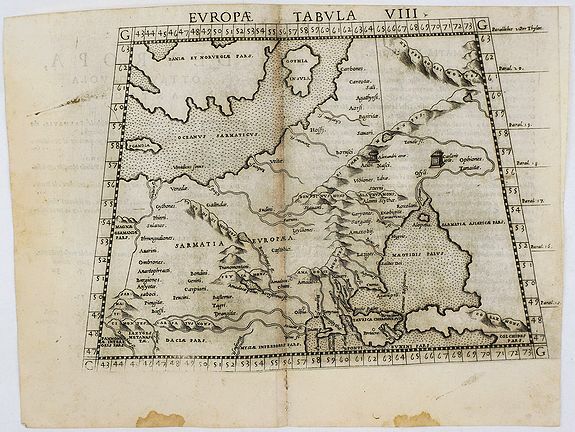 Old map by RUSCELLI -Europae Tabula VIII. Size: 7.5 x 10.2 inches. Condition: In good condition. A small tear (1,5 cm) to the lower edge along the central fold. Two small water stains to the lower edge. A Ptolemaic map of eastern Europe, including a portion of Scandinavia, Poland, Lithuania, Ukraine and Russia, stretching from the Swedish island of Gotland (Gothia Insula) to the Black Sea. This edition was printed in Venice by Vincente Valgrisio, and edited by Girolamo Ruscelli, with the maps engraved by Giulio Sanuto.​ Italian text on verso. Comes from the book “La Geografia di Claudio Tolomeo Alessandrino”.